So, alongside a medium coffee (caffeine addict right here), I ordered a Turkey Sausage Flatbread Sandwich from Dunkin’ Donuts. It was made fresh, and was steaming hot when I got it, so I was quite content with that. Another weird quirk of mine, I never eat sandwiches whole. I eat them piece by piece. So first I ate one side of the flatbread, then the egg/sausage component, and then the other side of the flatbread with cheese. I can’t help it, I just like to eat sandwiches this way. Although I did also try a bite of the sandwich all together and it was quite delicious. And here’s a closeup of the sandwich. 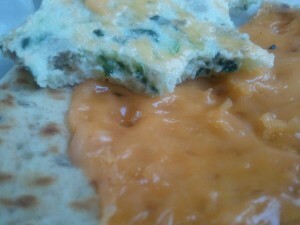 The flatbread itself was chewy and doughy on the inside, and then the outer edges had a slight crisp/crunchiness to it. It was rather bland in flavor by itself, but went well with the egg and cheese component when I ate it together. 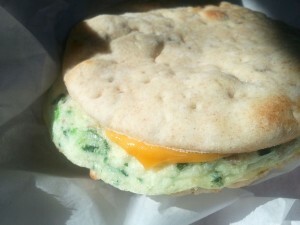 The egg part was really delicious, and had a fluffy consistency which surprised me that it wasn’t rubbery at all. It had some green pieces in it which I’m assuming would be spinach, along with pieces of turkey sausage. The turkey sausage was really good, and had a bit of spice to it. I haven’t had sausage of any kind in the longest time, but the turkey sausage (from what I remember) tasted very similar to regular sausage. 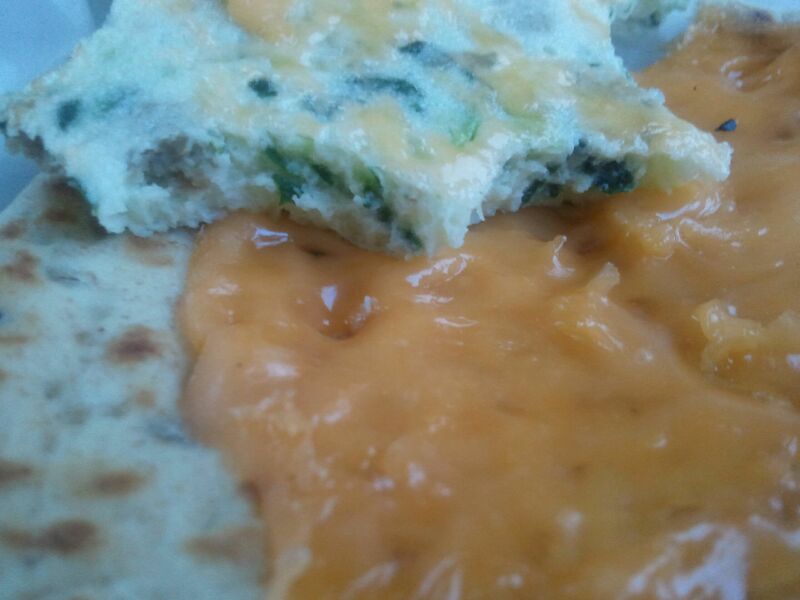 The cheese on the other piece of flatbread melted well, but really didn’t add too much to the sandwich. The flavors of the egg and sausage part overpowered the flavor of the cheese. Overall, I enjoyed this. It was kind of small, maybe about the size of my hand with extended fingers. It had a lot of flavor and was really quite good. I would buy it again for sure, and it wasn’t terribly high in sodium, fat or calories. It had 280 calories, 8 grams of fat, and 770 mg of sodium. I would give it 4 stars. Full nutritional information can be found here . Although after looking at that ingredient list, I don’t think I will be buying this very often. Too long!